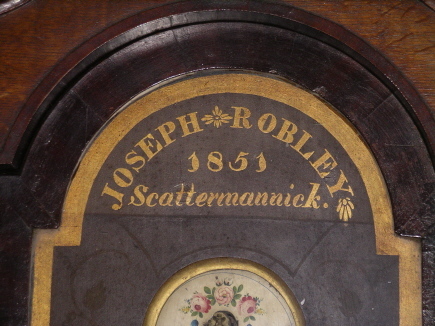 JOSEPH ROBLEY of Scarrowmanwick 1801-1874. Scarrowmanwick Farm. Joseph moved here with his parents as a very young child, and lived here for most of his life. Joseph Robley, son of Thomas Robley and Elizabeth Dixon, was baptised on 28 November 1801 at Castle Sowerby in Cumberland. On the 1841 census Joseph is recorded at Scarrowmanwick with his parents, Thomas & Elizabeth, brother Isaac and sister Elizabeth (Betzy). He appeared on the 1851 census, lodging at Castle Carrock, and is described as a cattle dealer. Joseph is back at Scarrowmanwick at the time of the 1861 census. He has a wife, Jane, & 4 sons Thomas (8), James (7), Joseph (5) & Isaac (9 months). Joseph was still at Scarrowmanwick in 1871 with wife, Jane, & 5 of his 6 children: Thomas (18), James (17), Isaac (11), William (7), John (5). His son, Joseph is missing from the census but is definitely not dead (he was my grandfather!). Joseph Robley married Jane Craggs on 10th April 1852 the Parish Church in the Parish of Gilling in Yorkshire. Joseph is described as a bachelor, aged 40 and by profession a farmer. He resided at Scarrowmanwick in the Parish of Kirkoswald, Cumberland. Jane was 30, a spinster and living at Hartforth, (Yorkshire). Joseph's father, Thomas was a farmer and Jane's father, James Craggs was a labourer. The witnesses were, Joseph Craggs, James Craggs, Hannah Warwick, John Thornton. We do not know how Joseph and Jane met. We do know, however, that Jane was living in Newcastle at the time of the 1851 census. She was at the house of her married sister, Margaret Moore. Margaret is described as a provision dealer, her husband Robert Moore as a publican and Jane Craggs was a house servant. Thomas Robley,c. 7 October 1852 in Croglin Church. James Robley, c. 4 March 1854 in Croglin Church. Joseph Robley, Born 14 February 1856, at Scarrowmanwick, Kirkoswald ;christened, 7 April 1856 in Croglin Church, died 20 April 1904 at Midtown, Cumwhitton, interred at St. Mary's churchyard, Cumwhitton 23rd April 1904. Isaac Robley, c. 27 September 1860 in Croglin Church. William Robley, c. 27 August 1865 in Croglin Church. John Robley, c. 13 January 1868 in Croglin Church. Joseph joined the Royal Marines on 20th August 1823. He enlisted at Langholm in Dumfriesshire, and described himself as a labourer. He was "aged twenty two years, five feet six & a half inches high, fair complexion, blue eyes, brown hair." He was transferred to the Royal Marine Headquarters at Chatham in Kent. He was discharged at Chatham 22 April 1825. Joseph is recorded at Scarrowmanwick on the 1841 census; in 1851 he was lodging at Castle Carrock & is described as a "cattle dealer". 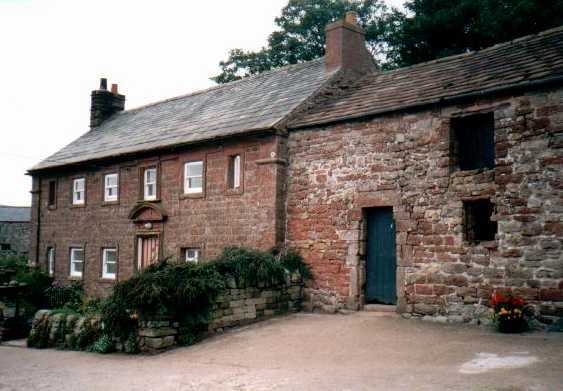 After his marriage he settled at Scarrowmanwick, and his 6 sons were brought up there. His father, Thomas had died in 1849 leaving the whole of his real estate & effects to his wife, Elizabeth, for her lifetime after which it was to pass to Joseph and his youngest brother, Isaac. When Elizabeth died in 1864, Joseph seems to have taken on the responsibility of looking after the Ship Inn. Register of Licences granted in the Division of Leath Ward, 1873. A recent series of "The History Detectives", on television, uncovered the story behind objects passed down in families through the generations. It reminded me of the Joseph clock. Joseph built a clock and when he died he left instructions for it to pass down, through each generation, to a Joseph Robley in the family. Thus it went to Joseph of Cumwhitton (my grandfather), then to his son, Joseph Robley of Shepherd's View, Castle Carrock (my uncle) and it is now in the house of Joseph of Demesne, Cumwhitton. The clock is a bit of a hybrid. It has the workings of a cuckoo clock, and the body of a grandfather clock. We can assume then that Joseph liked tinkering with things. We can note also the unusual spelling of Scarrowmanwick. Was it pronounced "scattermannick" in Joseph's time? The Scarrowmanwick Robleys were noted wrestlers in the Cumberland & Westmorland style. Joseph's brother, John won the westling at the Melmerby Rounds in both 1818 and 1819. John emigrated to Pictou, Nova Scotia about 1822 with his brother, William. Thomas soon followed them. Joseph stayed behind and according to the Victoria History of Cumberland (vol.2. p.485), "Joseph Robley of Scarrowmannock --- is credited with being the originator of the swinging hype, a modus operandi, he used for many years with considerable effect in east Cumberland". In Robinson & Coward, "Wrestlers & Wrestling" there is again a mention of Joseph and the "swinging hype". In the chapter on William Richardson of Caldbeck it is recorded: "Richardson acknowledged afterwards that he stood most in awe of Joseph Robley of Scarrowmanwick, from the exceedingly clever manner in which he swung his opponents. Robley, by the way, has been credited with being the first introducer of the "swinging hype". They met in the third round, and the Caldbeck veteran succeeded in disposing of the one he looked upon as his greatest bugbear." Extract fom June 1st 1830 edition. The wrestling for 5 pounds formed the chief attraction and better sport was never witnessed. Second prize for the last 16 Standers. Final round Jos Robley beat Jos. Wills. Another champion wrestler was William of Egremont. Francis Galton in his book "Heritary Genius" uses the Robleys as an example of genius in wrestling. Joseph died on 8th June, 1874 aged 72 years. He died in a diabetic coma. His occupation is given, on his death certificate, as "Landed proprietor and Innkeeper". 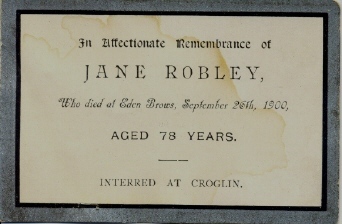 Jane died at Eden Brows, September 26th, 1900. They were buried together in Croglin Churchyard.